We’re just six weeks away from the new US popularity data release, so let’s have the Trendwatch 2018 Report! Every year, I make my best guesses about the baby names most likely to crack the US Top 1000 in the coming year. Trendwatch 2018 predictions were evaluated against the data released in May of 2018 – which actually represents all births in calendar year 2017. Confusing? Maybe a little. But it reflects the current year in which we receive the information. In 2017, it took 202 births for a boy name to make the US Top 1000. A handful of names given to 201 boys also made the list, but it goes in alphabetical order, and cuts off after the list reaches 1000 entries. That means that a name given to, say, seven or 23 or even 52 boys last year will almost certainly not gain in use dramatically enough to reach the Top 1000 this year. You’ll notice that the total births for 2016 almost always reflect a number within striking distance of 200. 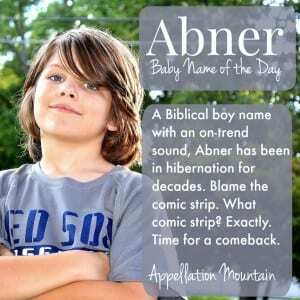 Abner has stayed frozen in time for years, a comic strip name seldom heard in the wild. But Abner carries the same homespun quality as Arlo or Emmett. It’s a modest name with style to spare. Friendly nickname Abe makes it more versatile, and the -r ending puts it in the company of fast-rising powerhouse picks like Asher, as well as so many stylish surname names. One more bonus? This Biblical appellation means “My father is light” in Hebrew. But this year? Abner tread water, failing to move upwards in use. Read more about Abner here. Leo makes the current Top 100, so how ’bout Aries? It’s also an astrological sign, associated with spring births (March 20th to April 19th) and symbolized by a ram. Ptolemy described the constellation back in the second century, so that puts Aries in the company of another quickly-rising boys’ name: Orion. It’s a powerful name, but also a soft one. With names like Adonis, Apollo, and Atlas gaining fast, Aries fits in better than you might think. That said, it’s held steady over the past two years. I’ve yet to write about Aries. Check back and I’ll udpate when I do. Celebrities aren’t always influential – for every Knox, there’s a Pilot. But recent newcomers to the Top 1000 included Fox. Parents are warming to straight-up animal names, as part of our never-ending search for nature names that convey positive qualities. Combined with a handful of high-profile baby Bears, including Kate Winslet’s son, born in 2014, that might be enough to push this one into the rankings. It could also be a nickname for many bear-related names … but I think we’ll hear this one on its own more and more often. It moved slightly higher in terms of total births, so maybe fierce and cuddly Bear just needs another year or two to catch on. This name fits with longer, vaguely vintage boy names like Sebastian and Theodore, and I’ve been watching it for a while. Benedict shares the friendly Ben nickname with Benjamin. And then there’s Benedict Cumberbatch. The leading man rose to international stardom as the twenty-first century version of Sherlock Holmes, became a serious, Academy Award-nominated actor, and joined the Marvel Universe as Doctor Stephen Strange. Catholic parents have embraced Benedict thanks to the Pope Emeritus, but I can imagine this name appealing to parents for a great many reasons. But while it’s inched up in use, it’s not quite gone mainstream – yet. Sometimes a popular name is all about sound. That’s almost the case with Boden, sometimes heard as a surname with several possibly origins. But consider the Bo- names parents have embraced: Bowen ranks in the current Top 500. Meaning-rich Bodhi is gaining fast, with Bode and Bodie not far behind. Beau appears in the current Top 200. So that’s a lot of Bo. Factor in the popularity of British clothing retailer Boden, especially the stylish Mini Boden line for kids, and it’s easy to imagine parents drawn to this modern moniker. In fact, Boden just managed to sneak onto the lists in 2014 and 2015, but continues to miss by just a few dozen births. I’ve yet to write about Boden. Check back and I’ll update when I do. Total the spellings Caius and Kaius, and this ancient name could already be in! This ancient name carries a joyful meaning – we associate it with the Latin gaudere, rejoice. It was originally spelled Gaius – as in Gaius Julius Caesar – so that makes it a powerful choice, too. It shares sounds with mini name Kai; maybe that’s why the K spelling has gained in use, too. Fashionista and reality star Rachel Zoe named her second son Kaius in 2013. With ancient names and -s ending boy names continuing to trend, Caius could be big. But maybe I’m ready to call this one a miss, because it has plummeted in use – with both the C and K spellings – over the last two years. We all know there’s a fictional prince by the name, in CS Lewis’ Narnia ‘verse. And it sounds like so many traditional boy names, like Julian and Adrian. 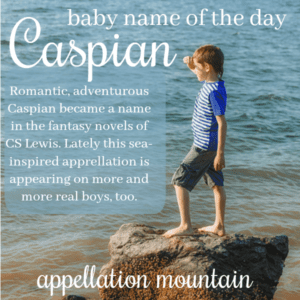 It would be easy to imagine that Caspian was some accidentally overlooked name. 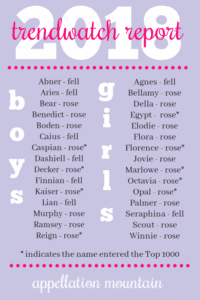 But that’s not so; Prince Caspian was published in 1951, but there are almost no boys with the name prior to the 1990s. In 2000, just eight boys were given the name. But it’s gained steadily in recent years. With place names so much in favor, the Caspian Sea boosts this one, too. It was enough to push it into the Top 1000, with an impressive debut rank of #868. Read more about Caspian here. I’ve been watching Dashiell for a while now. After all, June 2018 brought the return of The Incredibles. The Disney-Pixar sequel includes Dashiell “Dash” Parr, the middle Incredikid, the one with super-speed as his super-power. The original 2004 movie put Dash on our radar, and eventually pushed it into the Top 1000. I guessed literary, romantic Dashiell would make the charts, too, but in fact, dropped in use by around 50%. 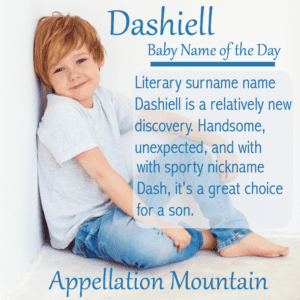 Read more about Dashiell here. Decker strikes the same note as other tough-guy names like Ryder. 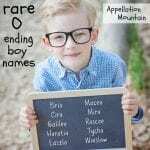 Because names like this do occur as surnames, they feel perfectly wearable for real boys. And yet they’re in a very different category from the liquid sounds of Noah and Sebastian. Names like Ryder and Decker are just a little bit brash, and that appeals to many parents. Decker specifically makes my maybe-list thanks to Deckard Shaw of The Fast and the Furious franchise. It’s not exactly the same, but it’s close. As an occupational surname, Decker belonged to a roofer; but in American parlance, “to deck” has meant to knock someone out since the 1950s. It’s a preppy hellraiser name, a brother for Wilder or Brooks. And all of that combined to put it in the US Top 1000 for the very first time. I’ve yet to write about Decker, but check back and I’ll update when I do. Take Finn, add the -ian ending and ta-da, instant on trend name. Finnian is no modern invention, though; instead, it’s a staple for Irish saints over the years. While it’s never been popular in the US, parents have embraced many a longer Finn- name: Finley and Finnegan also make the current US Top 500. Upbeat, Irish, and friendly, Finnian could easily join names like Aiden and Rowan on the playgrounds of today. The Japanese manga and anime series Black Butler uses the name for a character, which might make it familiar to a generation of future parents. I also like it for its similarity to favorites like Julian and Adrian. But so far? Finnian is actually falling in use. Read more about Finnian here. Kaiser almost made the Top 1000 list the year before, but it officially tipped over this time around. The German form of Caesar, it’s a title, just like fellow Top 1000 names King and Messiah. Teen Mom star Jenelle Evans named her son Kaiser in 2014. The name doubled in use by 2015, and climbed even higher by 2016. The momentum continued, and Kaiser made the charts in the most recent year. I’ve yet to write about Kaiser; check back and I’ll update when I do. At first glance, I thought Lian must be feminine, a simplified spelling of Lee Anne. (Which has more spellings that I can count!) But it’s not. Instead, it seems to have evolved as a short form of Julian and Elian and other -lian ending names. Though it may also trace its roots to Asia, with possible origins in Chinese and Vietnamese. With Liam at the heights of popularity, it’s easy to imagine Lian appealing, too. So far, though, Lian is holding steady, just outside the current popularity charts. I’ve yet to write about Lian, but check back and I’ll update when I do. Murphy, at first, seems more like the name of a pub or a tavern. It’s friendly and casual, but is it a given name? Fictional journalist Murphy Brown argues that it is; so do a small, but steady, number of men (and a few women) who have received the name over the years. It carries a great meaning – sea warrior – and fits right in with Riley and Brady. Murphy appeared on the charts in the nineteenth century, and as recently as the 1950s, but so far, remains outside the Top 1000 in this century. Surname name Ramsey has a tough-guy image: there’s demanding celebrity chef Gordon Ramsay, straight-talking financial guru Dave Ramsey, plus that first syllable: ram. It tracks with rising choices like Remy, too. Interestingly, it’s rising for boys and girls alike. But the numbers give this one to Team Blue, at least for now, and I think it fits well here. The Ramsay spelling makes it a Game of Thrones baby name. It’s also a Scottish clan name, complete with a signature tartan and a castle or two. Reign recently made it into the girls’ Top 1000. Now, the boys have followed. After all, Kourtney Kardashian named her youngest son Reign Aston in 2015. It fits with all of those regal choices, like Kingsley and Royal, that we hear, especially for boys. Lest you dismiss it as too grand, I wonder if some parents see this as a spiritual name, as in “Jesus reigns,” or perhaps a secular, but equally meaningful one, since freedom reigns, too. I think we’ll see this one in the middle spot an awful lot in the coming years, as well as in the first spot, too, for boys and girls alike. Read more about Reign here. 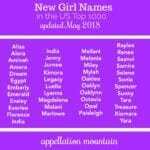 In 2017, it took 258 births for a girl name to make the US Top 1000. A handful of names given to 257 girls also made the list, but it goes in alphabetical order, and cuts off after the list reaches 1000. The same disclaimers apply to the girls’ list as the boys: a name given to only a handful of girls last year can rise dramatically, but rarely will it skyrocket into the Top 1000 in a single year. However, the girls’ list does tend to be slightly more volatile. Still, you’ll notice that all of the names on this reported births in 2017 somewhere in the 200 range or higher. When Jennifer Connolly and Paul Bettany named their daughter Agnes Lark in 2011, I expected this name to experience a revival. It’s an impeccable classic, with centuries of use. And it was a Top 100 staple from the late nineteenth century into the 1920s. So far, though, Agnes remains just outside of the rankings, even while Abigail, Alice, and Amelia soar. Nickname Aggie is every bit as wearable as Maggie, Maddie, Addie, and Abby, too. It slid in use by a few dozen this year, so maybe Agnes isn’t quite ready for revival. I feel like I’ve been talking about Bellamy for ages, at least since I heard it on one of the Novogratz design family kids. (Her twin sister is Tallulah!) 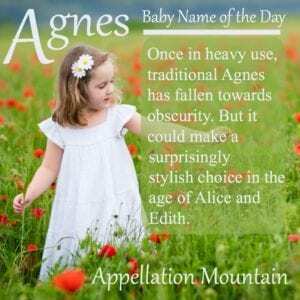 It has it all – the surname style of Harper and Hadley, the Bell- of Isabella and company, the three-syllable, ends-in-y rhythm of girls’ names from Emily to Dorothy to Avery. Bonus? It means, roughly, beautiful friend, from the French phrase bel ami. And yet, it’s only slowly started to catch on. But now that Everly is everybody’s favorite, I keep thinking Bellamy must be right behind. The gain in use going into this year suggests I’m right. Thanks to a male Bellamy on television’s The 100, the gain in use is even more dramatic for boys. Could it be the next Everly? Ella and Stella and Bella and so many similar-sounding names have ruled the charts for ages. Why Della, and why now? It feels similar but different, a little bit vintage and unexpected. Singer Billy Joel welcomed daughter Della Rose in 2015, putting it back on parents’ radar. And it has a handful of other positives ties: Della is the young wife in O. Henry’s 1906 tale The Gift of the Magi. A Top 100 choice in the late nineteenth century, Della feels sassy and retro, but undeniably on trend. And yet, the name remains steady, relatively undiscovered. I’ve yet to write about Della. Check back and I’ll update when I do. Parents love place names, from Brooklyn to Savannah and beyond. Cairo features in the current boys’ Top 1000, while Egypt is catching on for girls. The name tipped into the rankings after years of steady gains. HGTV host Egypt Sherrod might have influenced some parents. But it’s not entirely novel. Way back in 1798, Lucien Bonaparte named his daughter Christine-Egypte. In the late 1980s, soap opera Loving introduced a character by the name, too. More recently, Alicia Keys gave the name to a son. I’ve yet to write about Egypt. Check back and I’ll update when I do. 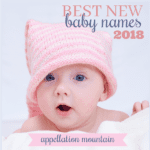 Has any name been more favored by the baby naming community, while still so ignored by the naming public at large? Elodie might win the crown in that category. A long-time darling of baby naming forums, Elodie made the Top 1000 just a handful of times in the 1880s before heading towards obscurity. A French name borrowed from a Spanish martyr, Elodie fits right in with names like Eloise and Eliza, but remains nicely underused – for now. It gained slightly in use, putting it within striking distance of the Top 1000 next year. Nora makes the Top 100. So do Cora and Aurora. So why not Flora? It shares the sound and the botanical tie-in, a goddess name from ancient Rome with a lush, vintage sound. If girls can be Lily and Violet, why not the whole garden? It’s the kind of ecovintage pick that’s just slightly different, and likely to appeal to parents after something just slightly novel. Indeed, Flora continues to gain in use, suggesting that a return to the rankings may be imminent. Speaking of gorgeous, ecovintage girls’ picks that run the whole garden, how about Florence? If Flora feels pretty, Florence sounds sensible – and edgy. That’s thanks to a combination of two factors: nursing pioneer Florence Nightingale, and indie rockers Florence and the Machine. Nightingale was named after the Italian city at the heart of the Renaissance, which makes for another reason to choose this name. The British love Florence. Americans are slowly re-discovering this traditional choice, but now that it’s re-entered the Top 1000, I expect it will follow other revivals, like Louisa, into greater use. Jovie just plain didn’t exist as a given name until 2003. That’s when we met Zooey Deschanel’s character in Elf. The tale went from quirky seasonal success to holiday season staple, and Jovie rose right along with it. It must come from jovial, which means joyful and comes from the Latin Jove, as in Jupiter. It could also tie to names like Jovana, a feminine form of John. Together, they lend this modern invention a feeling of roots. And for a daughter born during the holiday season, it’s still less expected than Holly. But while Jovie gained slightly, it’s still a ways outside of the Top 1000. Remember Caius + Kaius? Marlowe suffers from the same affliction. Factor in 92 Marlos and 91 Marlows, and this name would have appeared in the Top 1000 for a while. Instead, Marlowe – the most popular spelling – debuted on the charts last year. Parents love surname names for girls, from Madison to Harper to Harlow, so no surprise that Marlowe caught on. Olivia reached the Top Ten back in 2001. No surprise, then, that parents are considering names similar in sound. Ophelia re-appeared in the US Top 1000 two years, and now Octavia has joined them both. Besides sound, Octavia has a fun meaning – eight, which ties it to August as well as the musical term octave. Plus, it’s ancient and literary – and has been in the Top 1000 plenty of times before. But credit for the name’s big gain goes to a warrior character on television’s The 100. Back in the 1910s, Opal ranked in the US Top 100. Yup, Top 100. A century later, it’s just barely returned to the Top 1000. But we’re all about O names, Ruby is wildly popular, and ecovintage rules. So shouldn’t Opal fit right in? It’s October’s birthstone, and ultimately comes from the Sanskrit word meaning simply jewel. Children’s novel turned movie Because of Winn-Dixie is yet another opportunity to rediscover the name. Some surname names, like Harper and Madison, are owned by the girls. Others, like Mason and Carter, belong almost exclusively to boys. Palmer continues to rise in use for boys and girls alike, but remains slightly more popular for girls. Maybe that’s the lingering influence of Twin Peaks’ Laura Palmer. But I think that’s down to Brooklyn Decker’s turn in the 2011 rom-com Just Go With It. Plus, Palmer picks up on Top 100 favorite Piper. I’ve yet to write about Palmer. Check back and I’ll update when I do. 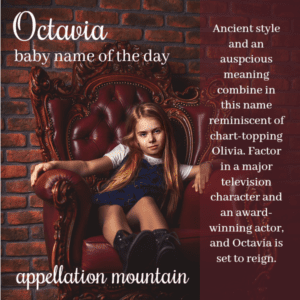 When Ben Affleck and Jennifer Garner named their second daughter Seraphina in 2009, I was sure the name would catch on – fast! And it did, rising from 50 births in 2008 to 150 by 2012. But my cautions apply here: very rarely does a game go from unused to everywhere. Slow and steady tends to win the day, and that’s the story of Seraphina. It sounds like an elaboration of traditional Sarah, but carries a great meaning – fiery! With long, romantic names like Isabella so established for girls, Seraphina fits right in – and seems likely to continue to rise. To Kill a Mockingbird has proved a powerful driver of baby naming trends. Think of Harper and Atticus. So how ’bout Scout? Jean Louise Finch is better known by this nickname in the enduring novel. That puts Scout squarely in girls’ territory – though it could easily be used for a son, too. She’s a thoroughly admirable character, spunky and principled, and in Go Set a Watchman, none of those qualities have faded, even though she’s now an adult. It’s the kind of name many parents crave for girls today – modern, spare, and rich with meaning. I’ve yet to write about Scout. Check back and I’ll update when I do. I’ve been watching Winnie, expecting it to make a Sadie-like jump, just like so many casual nickname-names that outrank their formal versions. (Hattie, Millie, and Tessa all fit this pattern, too.) So far, the name keeps on climbing – but hasn’t quite gone mainstream. Today’s parents almost certainly remember The Wonder Years’ Winnie, and late night talk show host Jimmy Fallon keeps the name in the spotlight, as it’s his older daughter’s name. It’s more than tripled in use over the last few years, though, so I think this could be Winnie’s year. Overall, four of the 15 names on the boys’ Trendwatch 2018 broke into the Top 1000. An additional five rose in use, and the other six declined in use. On the girls’ side, five of the 15 names entered the US Top 1000. Eight more climbed in use, and two declined. So those are the results for Trendwatch 2018. Next up: the predictions for the coming year! My grandma passed away last week; her name was Winifred Flora! Combining two of your predictions. We are having baby no. 4 in July and are considering these for middles if we have a girl. When I hear Winnie I think of 1) Winnie the Pooh and 2) Winnie Mandela. Don’t know if those associations are as strong in the US?